Back in the days when I was a student, going out on a date meant just simply walking around. I feel like I was just killing a huge amount of time walking around without any purpose. At first, I did actually go out to Disneyland or the movies, but to be honest, it’s just hard to follow up with the spending. I hardly had any money, but instead I had time, so that just made me stroll along from a city to another city. That is to say, to consume the copious amount of time I had. So basically, I walked a lot back then. One day, I decided to walk from Shinjuku to Hachioji with my friend. There was the school that I went in Hachioji, and we departed Shinjuku on 12’o clock on midnight. On the way to Hachioji, we made camp fire along Tama River, played our guitar and just kept walking lazily. By the time we got to our school in Hachioji, the arrow on the clock pointed at noon. There was a sense of accomplishment after a 12 hour walk, but when you actually check the distance from Shinjuku to Hachioji, there’s only forty plus kilometers. It took us 12 hours to get to the destination, but for a marathon runner, it would only take about 2 hours. One of the nice things about walking around the city is that there is a chance of encountering a nice shop. Another nice thing is that you get to feel the seasons through the smell of the wind. But I think this wasn’t the purpose of walking around the city. Just consuming time without any purpose and being skeptical about the current action. And at the same time, not doing things that should be done, or not being able to find the things you want to do. I think I was trying to get rid of this sense of rush by just simply walking around. When you visit Ho Chi Minh City in Vietnam, you can feel that this place is under a process of development. 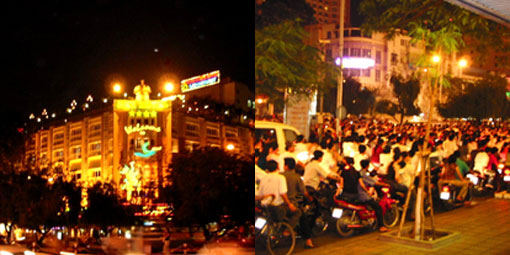 Rex Hotel is located right in the middle of Ho Chi Minh City, and lights up the city through its bright illumination. This building with a colonial feeling was built in 1925 during the French occupation, and the symbol of a gigantic crown rotating on the top of the building gives a Southeast Asian taste. At the same time, it seems to symbolize the current city. In front of the hotel, there is a roundabout where roads from four different directions intersect. This is a main transportation place where various motorcycles and cars go by during the day, and in the night, even more vehicles gather around. Once it gathers at the roundabout, it seems like as if their circling around the intersection. As the city gets dark, more motorcycles enter the roundabout, and after a while, it just covers the entire space. The flow of the bike resembles a growing typhoon. The honking, engine sound, and, people’s loud voice lasted until dawn without a pause. In a developing city, there are people that can go on the dynamic movement without any problem. At the same time, there must be people that have trouble getting on the dynamism despite sensing the movement. The people on the latter side just not being able to stay still and instead running around without any purpose seems to overlap with my days as a student walking around. A purposeless journey might be done with the same reason. If that seems to be the case, then it might be good to get out of the swarm and go out on an even wide place.